This DVD takes you to the best birdwatching sites in Extremadura both in spring and winter to see spectacular birds such as vultures, cranes, storks, bustards and eagles in some of Europe's best birding areas such as Trujillo and Monfragüe. The best sites - see what it's like to go birding in 15 sites and get an idea of what birds you might see and how close you could get to them. The best birds - sit back and enjoy footage of 77 species, including 5 species of eagle, 3 species of vulture, both bustards, both sandgrouse, Black-shouldered Kite, Little Bittern, Roller and Great Spotted Cuckoo, all filmed using high-definition digital video cameras. 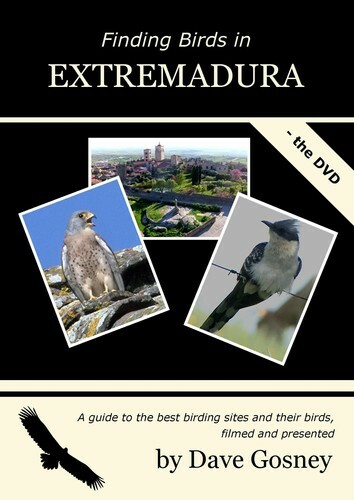 The best information - find out more about the sites and their birds, including tips on how to identify the eagles, vultures, warblers and larks and what to listen for to help you find birds such as Great Spotted Cuckoo, Little Bittern, Western Bonelli's Warbler and both sandgrouse. Travel around the country with Dave Gosney showing you what the birding is like at all the most popular sites and giving you a chance to enjoy footage of the best birds: Little and Great Bustards, Black Storks, White Storks, Common Cranes, Little Bittern, Black Vulture, Griffon Vulture, Lesser Kestrel, Black-shouldered Kite, Spanish Imperial Eagle, Golden Eagle, Montagu’s Harrier, Great Spotted Cuckoo, Western Bonelli's Warbler, Iberian Green Woodpecker, Azure-winged Magpie, Blue Rock Thrush, Rock Bunting and many many more. There is also coverage of Red Avadavat that have successfully become naturalised in the area.